Volunteers at Thompson-Ames Historical Society find themselves very busily involved in a wide variety of activities this spring. Following the Monday, May 2nd presentation of Sarah Smith’s “Salvaging Wood from the Storm of the Century, 1938” in the Meetinghouse, volunteers embarked on the annual field-trip activities that are offered for the students in Gilford Elementary School. Kathy Lacroix, Education Coordinator for Thompson-Ames Historical Society, arranged for two kindergarten field trips for Wednesday, May 4th, one at 9:45 a.m. and the other at 1:45 p.m. The three kindergarten classes visited the Grange Museum Building where they rotated among three field-trip sites with a fifteen-minute stay at each. “Wood” was a unifying thread throughout the kindergarteners’ field trip. Mary Frost, who acted as docent in the 1800s Homestead Room where the kindergarteners sat in front of the fireplace on a large braided rug donated several years ago by Darlene and Stuart Savage, pointed out the use of wood to make furniture and other household items, such as bowls and butter molds. In the 1940s Grange Kitchen, Don Frost showed and demonstrated wooden toys of historic design which have been made by volunteers over the past seven years; then he helped the children learn how to play with a variety of the toys. In the third field-trip site, the Historic Store, Stan Piper called attention to many uses of wood, including tools, store counters, snow scoop, checkers on the checkerboard, mail sorter, etc. Each spring the kindergarteners participate in this type of field trip as they learn that Gilford’s historical society preserves and displays vintage items so that visitors can learn about Gilford’s history. Other field trips out into the village help the youngsters learn about the roles of the various Gilford community organizations and sites that perform services for its citizens. Friday afternoon, May 6th, saw the first of the fifteen field trips scheduled for this year’s students in grade three as part of their study of the community of Gilford. Mrs. Cozort’s class, accompanied by four parent volunteers, walked down the “red brick sidewalk” after lunchtime and arrived at the Grange Museum Building about 12:45. After a greeting and brief introduction, the students formed into four prearranged groups, each with an assigned parent volunteer who led the youngsters through the four field-trips sites set up for the afternoon’s activities. T-AHS volunteer Priscilla Puleo used a kitchen timer to keep track of each 20-minute session before she rang an antique school hand bell to signal that it was time to rotate to the next activity site. Upstairs in the Grange Museum Building, volunteer Carol Anderson greeted each school volunteer and his/her group of 4 or 5 youngsters and explained the origin of the Grange and its importance to Gilford as well as the concept of service projects. Then each youngster and parent volunteer sat at the antique tables and used fabric markers to create a design on an 8”x8” piece of muslin. These unique pieces of artwork will be sewn by volunteers Mary Roy and Sue Keene to create ABC quilts which will be given to at-risk babies in and outside the United States. Meanwhile, downstairs in the Historic Store, volunteer Stan Piper greeted each school volunteer and his/her group of students. As Stan led the group around the several display areas, he pointed out some of the vintage tools, many of which came to T-AHS in 1943 from the Potter Farm, which is pictured in a late 1800s photo on display in the store. The 100 year-old clamshell printing press in the print shop area of the store is always an opportunity for visitors to see how type was set in a time before the advent of computers. Children soon realize that the merchandise displayed would appeal to not only the farmer and farmer’s wife but also to the children who would have come to the store on one of those infrequent yet much-anticipated trips to town to get mail and make purchases. Three volunteers were on hand to help the youngsters learn about and participate in farm chores that girls and boys routinely did outdoors on the Family Homestead. The boys, who had donned overalls, accompanied volunteer Jim Colby to fetch water from the well so that the girls, who were wearing long gingham skirts and mob caps, could use vintage laundry items, including a washboard, to do the family washing under the leadership of volunteer Joanne Colby Clark. Then all the youngsters helped beat the dirt out of the rag rug that was airing on the clothes line and to go in search of the eggs that the chickens had laid here and there on the farm. 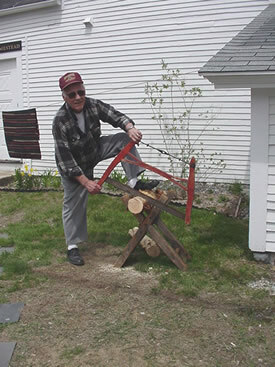 The culminating outdoors chore was made possible by volunteer Jerry Lacroix who brought along a hefty tree limb and an antique cross buck so that pairs of third graders could use a vintage bow saw to cut pieces of fire wood. The final third-grade field-trip activity at the Grange was a visit to the Homestead Room, where volunteers Diane Mitton and Mary Chesebrough guided the youngsters into understanding how, in time of necessity, a whole family could live in a one-room house while the essential family effort would be put into establishing and running the farm, the source of food, milk, wood, and material for clothing for the family. Back at school the third graders had received pre-field trip items in the form of doll-size furniture, including a rope bed, trundle bed, drop leaf table, wooden chair, etc., to prepare for the field trip experiences at the Grange. In the Homestead Room, their classroom studies came to life. By 2:30 the field trip for Mrs. Cozort’s class had come to an end and hearty good-byes were waved as the class walked back to the school in time for afternoon dismissal. started to weed, turn the soil, and relocate a few of the perennials, many of which are already in bloom, giving a much-appreciated burst of color after the starkness of winter’s white has melted away. Plans for the Rowe House Plant and Baked Goods Sale, scheduled for Saturday, May 21 st are rolling along and Gator Sign Shop, on Weirs Road in Gilford, created two eye-catching signs to remind the public of the sale – and to remind gardeners of the opportunity to share some of their perennials as dividing occurs. Also, plans for the Heritage Arts and Crafts Bees scheduled for Saturday morning, May 21st are being finalized. Volunteer Carol Anderson wishes to remind folks that rug braiding and knitting will continue while other ideas and sample projects are welcomed. Volunteers Stan Piper, Gus Pinto, Jerry Lacroix, Herb Riley, Jim Colby, and Don Frost are comparing notes as they plan to continue to offer to enthusiasts of all ages opportunities to create wooden toys of historic design. “Will-o’-the-of-Wisp” kits offered in April are still available. There are endless opportunities for volunteers to help preserve and celebrate Gilford’s cultural history. For further information, please call Thompson-Ames Historical Society at 527-9009 and leave your name, telephone number, and a message and you will receive a return call. Also, do log on to T-AHS’s website, www.gilfordhistoricalsociety. org.